As errors, misstatements, retractions and head-scratching rationalizations tumble over each other in the case of Malaysia Airlines Flight 370, the world is coming to recognize what the country has known for decades — that Malaysia’s leaders are accustomed to getting away with murder. 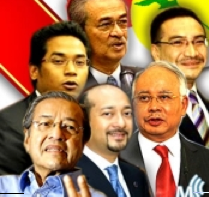 via INEPT BUT BULLYING: Malaysia’s bumbling RULING ELITE. This entry was posted in Air Disasters, Life and tagged BN, Malaysian Govt., UMNO. Bookmark the permalink.